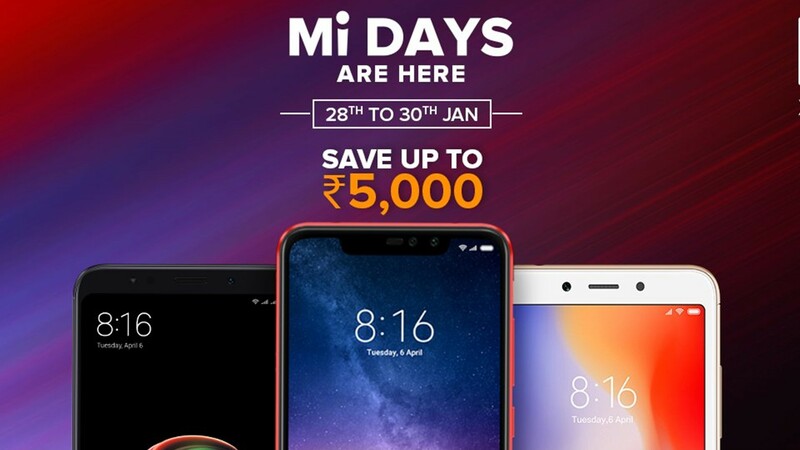 Xiaomi India is hosting Mi Days over at Flipkart where the company is going to be offering some discounts on their bestselling products. The Mi Days start from midnight, December 28 on Flipkart and will conclude on January 30. Xiaomi is offering discounts on Redmi Note 6 Pro, Redmi Note 5 Pro, Redmi 6 and POCO F1. There are some additional offers running on these smartphones as well such as the option to purchase via No cost EMI and buyback offers. The 4GB variant of the Redmi Note 6 Pro originally priced at Rs 15,999 is now down to retailing at Rs 12,999 inclusive of an extra Rs 3,000 flat off. Additionally, under a Flipkart exchange scheme, buyers can get upto Rs 12,600 off on exchanging their old phones for the Note 6 Pro. Flipkart also offers a No cost EMI solution for various banks and for as low as Rs 2,167 per month. Similarly, the 6GB variant of the phone now retails for Rs 14,999 on Flipkart. Xiaomi claims that it has sold over 10 million Redmi Note 5 Pro units in India and as part of the Mi Days celebration on Flipkart is offering a discount of Rs 4000 on it. The original price for the 4GB variant of the Note 5 Pro was Rs 14,999 while the 6GB version of the phone now retails at Rs 12,999. There is a No cash EMI option under which buyers can pay for as low as Rs 1,834 per month. The Redmi 6 has got an additional discount of Rs 1,500 making it available for Rs 7,499 for the 3GB variant with 32GB storage. The phone has 12MP + 5MP dual rear camera setup and an octa-core MediaTek P22 chipset to along with it. The 64GB storage variant of the phone retails at Rs 8,499. One of the most exciting phones to come out of last year, the POCO F1 is being offered for Rs 18,999 with 6GB RAM and 64GB storage. The 128GB storage variant now retails for Rs 21,999 as opposed to the original price of Rs 24,999. The high-end variant with 8GB RAM and 256GB storage can now be bought for Rs 25,999 as well. Flipkart is offering a No cost EMI option for interested buyers and an exchange offer with upto Rs 14,900 off on exchange of old smartphones.